Human beings are a curious lot and throughout history there have been some extraordinary ways that we have sought to inform future generations of our discoveries. But in order to get an accurate idea of how the body works, you have to have access to detailed teaching models. Here at 3B Scientific we’ve been fascinated to find out more of the precursors to our high quality, detailed anatomical models. Initially, medical education was gained via the dissection of cadavers. But, as you can imagine, getting hold of enough dead bodies by legitimate means could be a little tricky and often models were made from wood, ivory and wax. 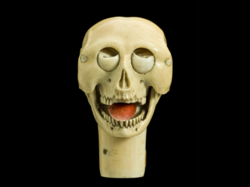 The rather crude looking model of a skull was made so that the eyes rolled and the tongue and lower jaw moved. People during the 18th century were fascinated by public museums that had displays of gruesome artifacts displayed to 'educate & entertain.' But some more medical collections were only allowed to be viewed by medical men or were 'invitation only'. This was a time when medical science had begun to flourish and the demand for cadavers, for research purposes, increased. Bodies of executed criminals had previously been used but, due to a decline in the number of executions, there was a shortage in the supply of cadavers. In 1828 public interest was further roused by the topic of anatomy due to the horrific scandal caused by the notorious murders of Burke & Hare. William Burke and William Hare had committed a series of murders in Edinburgh, Scotland, and sold the resulting corpses (16 in total) to Doctor Robert Knox for dissection material in his popular anatomy lectures. Doctors during the 17th and 18th century were keen to show off their expert knowledge rather than impart any actual education. 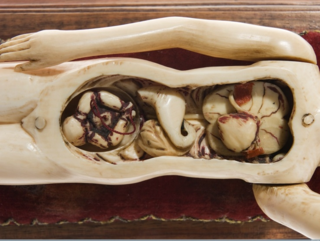 These ivory anatomical figures had removable parts, including the intestines and, in the case of the female model, would have had a tiny ivory foetus complete with red string umbilical cord. If you’ve seen our OB/GYN simulators, you’ll realise the amount of precise detail and information that students now have access to. 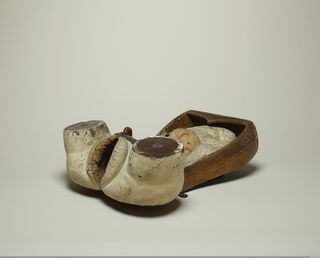 However, in previous centuries, this parturition simulator was the most detailed tool that a midwife or doctor had to simulate childbirth. Although, given the age of this simulator it’s remarkable how ingenious it’s makers were. Doctors needed a way to extend the ‘life’ of the cadavers that they used for teaching models. 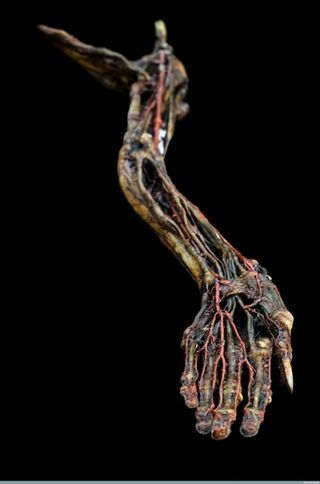 By the 1800’s a Dutch Botanist and Anatomist called Frederik Rujsch came up with the idea of injecting cadavers with wax to preserve them. He also perfected a secret embalming fluid called ‘liquor balsamicum’. Interestingly, and rather strangely, his daughter Rachel who was an artist would often decorate the preserved limbs with lace! During the 18th and 19th century it was forbidden for women in China to show or talk about their bodies. According to Confucian beliefs it was thought that they should protect the sanctity of the female form. This naturally caused rather a problem if a woman became ill and needed the advice of a doctor as she couldn’t be seen by him or even mention parts of her body to him. During her visit to a doctor she would stay hidden behind a curtain and it’s thought that she would have used a diagnostic doll held through the curtains to indicate to her doctor what part of her body she was referring to. Also during the 1800’s French physician Louis Thomas Jerôme Auzoux perfected the art of papier-mâché anatomical models. 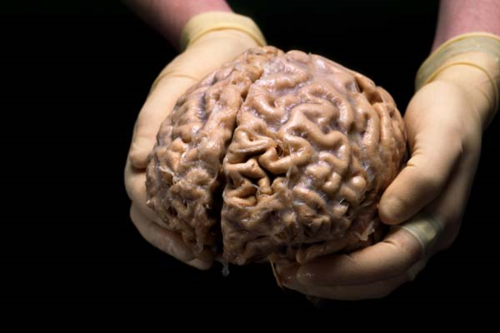 He presented a male anatomical model made entirely from paper-mâché to the Paris Academy of Medicine in 1822. 5 years later he began to mass produce anatomical models for hospitals, universities and scientists. The subject of human anatomy is fascinating and one that we are passionate about educating others about. We have built up an impressive catalog of anatomy products and medical simulators that are used by schools, universities, doctors, therapists and teaching hospitals around the world. You can see our full range of products on our website and there are FREE catalogs available for you to download. Wow! Awesome article! It always amazes me how far we’ve come with science and medicine. This was so informative, like a history lesson in human anatomical models over the centuries. I can’t even fathom the idea of trying to tell a doctor what’s wrong with you by holding a doll from behind a curtain and pointing. With how fast technology is advancing, I’m sure people in the future will look at our practices and find them “interesting” as well. Thanks for posting! Really great post! I’ve been looking around for something as detailed as that. Thanks! Just found this fascinating article, history is always interesting and models have developed very quickly in recent years. We now have some quite complex models of most of the human body, and in the future I’m sure 3D printing will develop further and come down in price. Meanwhile the study of human anatomy remains a fascinating area, and thank goodness we have decent anatomical models to study with. That’s a great article, really shows how far we have come, not only with the development of anatomy models but education in general. I’m quite sure that anatomy models will continue to develop and become more complex and detailed.